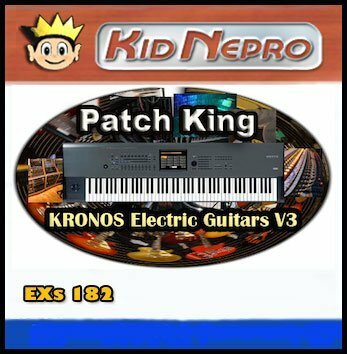 Kronos Electric Guitars V3 includes 16 guitar loops. There’s a few things to be said about how they work, so we thought it would be best to write a blog post about how to use them. Each loop has been loaded into the Kronos Drum track and can be accessed from there. The loops are saved in the User-DD Program Bank, Programs 32-47. However, while the loops are stored in those program slots, the actual program is blank, except for when you turn on the drum track and you will hear the loop play. All you will hear is the loop. Nothing else is included in the program. The real fun begins when you take those programs and add it to a combi. The loops are added to Part Ten, where the Drum Track usually goes. When you do this, you sync the loop to everything else in the combi. So, you can have drums, bass and guitar all playing at the same time. Any combi that has a guitar loop included will have the key that the loop is in as part of the name. For example, Combi #4 – Big Bad Guitarzan Eb LP, means the loop in that combi is in the key of Eb. We let you know the key of each loop to give you a heads up on what key to play when the loop is running. The limiting thing about the loops (while they sound great), is that they will only play in “one key at a time”. So anytime the loop is playing in (for example) Big Bad Guitarzan Eb, you have to play in the key of Eb. The same goes for any combi that has a guitar loop included. We have set all the combis that use the loops so that some of the eight KARMA scenes have the loop tuned on and some of them have the loop turned off. So, during the scenes that the loop is turned off, you can play in any key that you want. You can always mute part ten if you want to turn off the loop at any time. Another thing to note is the tempo of the combi has to match the tempo of the program, or else the loop will not play correctly when inserted into the combi. So, don’t change the tempo of the combi while the loop is playing. Also note that when your creating you own combi using the loop that you have you make both the program and combi the same tempo. Loops with the very fast tempos, like Chung Loop 4 – 201.43 BPM are should actually be set at half that tempo (100.71) to have everything sync up correctly. Please note that not all the guitar loops have been used in our combis. The ones that were left out can be inserted into any custom programs or combis that you would like to make yourself. We choose not to use the loops in all sixteen combis, since we wanted to have a mixed set of both traditional and guitar loops set up in the drum track. Either way it’s something cool and new for Kronos. We hope you will enjoy the results.